Charge Shot!!! : Stephen King is one of our best. Under the Dome proves it. Stephen King is one of our best. Under the Dome proves it. Stephen King is a serious writer. Surely I’m not talking about the writer of Cell, a novel in which people drop dead after answering an irresistible cell phone call? Yes, that Stephen King, prolific author of horror novels like The Stand, The Shining and It. Any objections to Stephen King as a serious writer serve to underline the pathologies in the American literary establishment. His novels aren’t stylistic experiments, or even formally ambitious. King is a master plotter and a prose writer of peerless imagination. Sure, Cell sucked, but King was never one to hold back, for better or worse. Like Walt Whitman, he’d much rather unspool his boundless fantasies than hold them in reserve. What could be more American? 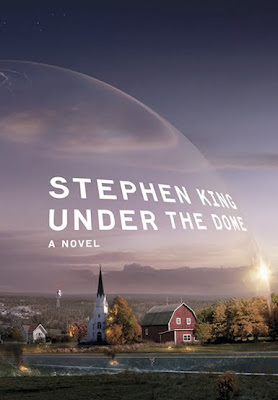 King’s latest, Under The Dome, is good. It’s very good. Part Cujo, part The Stand, it starts with a very simple question: what would happen to a small New England town if it were suddenly cut off from the world? Under the Dome confirms King as one of our greatest living novelists. Its sheer worth reminds us of the perils of dismissing its author, and pulp lit as a genre. Chester’s Mill, Maine is a town with a radio station, a news paper, a department store and a super market. A creek runs through it. A benign police department enforces the traffic laws, and little more (it doesn’t need to). On the day the dome comes down, a short-order cook named Dale Barbra is leaving town after a scrap with some good ‘ol boys. The sudden appearance of the dome changes his plans; indeed, it changes life for everyone trapped within its impenetrable walls. I’ll go no further. Rest assured, Under the Dome is a horror novel, but one of the finest pedigree. It doesn’t rely on gut-spilling, monsters or aliens – though guts do spill, and monsters evolve from neighbors, council members and police officers. Many King veterans live in fear of a botched, deus ex machina ending (I’m looking at you, Chris). King lets his stories evolve as he writes them, meaning he often writes himself into a corner. Anyone who’s read The Stand will know what I’m talking about. Under the Dome will relieve skeptics with an unexpected, but wholly satisfying ending. I mean, landing a 1,100-page behemoth with credibility fully intact is something of a masterstroke. I’m sure King isn’t complaining about his classification as a genre writer – it slots him dependably at the top of the bestseller list, which, given his prolific nature, means he isn’t hurting for money (recently, King and his wife Tabatha spent $13,000 to bring troops home for the holidays). Anyway, King seems untroubled by his literary legacy. Even after a hit-and-run led him to (temporarily) retire, he’s comfortable putting out a book like Cell, a book that probably should have stayed in his filing cabinet. He’s flirted with the literary establishment, granting an interview to a smitten Paris Review, and accepting a National Book Award for lifetime achievement. Take Lisey’s Story, a largely interior novel about a widow’s relationship with her deceased husband, a popular fiction writer. Here, King proves his virtuosic plotting and effortlessly fluid prose don’t depend on shock-jockery. The story is all that matters to King. If its primacy prevents him from farting out some faked, broody reminiscence on age, mortality, the fickle nature of retrospect, etc., all the better. Under The Dome reads like you’d hope a late-stage King novel would: a summary of his powers, an apotheosis of his particular craft. Were he to die tomorrow – bisected by the sudden appearance of an invisible wall, perhaps – I could think of no better swan song.